Nickname: "La Galerna del Cantábrico"
Francisco Gento Lopez was born in Guarnizo, Cantabria, 21 October 1933. Son of a truck driver, left school at fourteen to help his father and take care of the cows they had on a small farm. As a child when he ran around Guarnizo, he dreamed of playing for Racing de Santander. Never thought his name would be a world football legend and he would be considered the best left midfielder of all time. “The Strom of Cantabria” Francisco Gento is the most successful footballer in club level hold the all-time record the most champions of Spanish La Liga with 12 and the most European Cup Winners with 6, additionally holds with Paulo Maldini the record most appearances in European Cup final with 8. Gento was noted not only for having great speed (he used to be an athlete in his youth and could run 100 metres in 11 seconds flat and was almost as quick with a ball at his feet), but also for his skills with the ball and his relatively high scoring capabilities given his position. In 1963, He was selected as a start FIFA World XI against England. Gento totally played for Real Madrid 605 games and scored 183 goals. All in all, He is considered as one of the greatest Spanish footballers of all-time as well as the best left-winger in the world between the late 1950s to early 1960s. Incredibly, He never voted in top five Ballon d’Or in any year. At that time he started playing football in the “Nueva Montaña” team, alternating with the athletic sport, where he purchased the speed that made him famous as a footballer. Shortly afterwards went to the “Astilleros”. In this team and with only fourteen years, scored nine times in a regional championship game, earning him a move to “Rayo Cantabria”. In 1953 amounted to Racing Santander, where his name became a national attraction. Alvaro Bustamante’s references, vice-president of Real Madrid who was born in the same province that Gento, served that season to sign for the white team for a period of five years. His early performances for the club were a disaster and a disappointment. Extremely fast and lacks a polished technique, raids ended, most of the time, outside the boundaries of the pitch, forgetting the ball that was left behind. The arrival of Héctor Rial, a fine Argentine midfielder managed to temper the speed of Gento and make him profitable. Passes over 40 yards on the boot of the Cantabrian were finished in impressive gallops by the band in which he moved the ball a few yards and ran after him, overflowing with all that is put in front. Only stopped when he approached the line of lime which delimits the end of the field, then he took out his left leg and threw a measured center to the head of Di Stefano, Puskas or any other striker in that wonderful team. 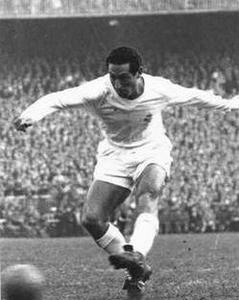 Francisco Gento always noted for his impressive speed and prodigious dribbling that left sitting all his rivals. This made him the most dangerous left side of the moment. Not noted for his height, but became the world's fastest extreme. Nobody at the time had his speed. Also had a terrible and powerful shot on goal. Maybe is better is we short the era , from the games that i see from him when he plays with Di Stefano we was a insane player but , when he plays with the Madrid "Ye-Ye" he was more slow and more a playmaker and leader to he's teammates. If you wanna Verifed Just Take a look of Channel of Zouzinho in youtube , and see the difference beetwen him playing with Madrids of Di Stefano and Madrid of the "Ye-Ye", where he was a Spiritual Leader. Also He's IT have to be in A , Di Stefano define Gento in these Words : " A Great Player and Athlete to the Club , with a incredible Speed , he almost never get injured and was the most regular player in the team".